A 404 error is returned by a web server (the machine where a website is hosted) when it cannot find the page you have requested. The most likely cause of this error is a mistyped URL. If you get a 404 error when accessing a website, first check to make sure that you have not mistyped the URL in the address bar of your web browser. If you still cannot access the resource you are looking for, it is possible that it has been renamed or moved, another common reason for this error. This often happens when you are accessing the web page using an outdated bookmark. In that case, your best bet is to enter the URL for the home page of the site (for FCIT that would be fcit.usf.edu) and then use the search function to look for a page matching your request. Some websites have a personalized 404 page that may provide links to the main sections of the website or other help. 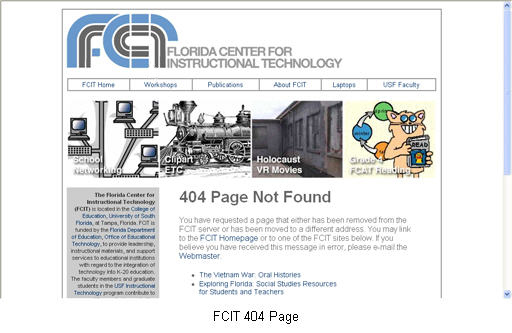 For example, the FCIT website has the following custom 404 error page that provides links to its most frequently requested publications. Internet Explorer 4.x and higher may substitute its own default error message page for the one created by the website’s designer if that option is enabled. To make sure you can always view the custom 404 error page on a website, make sure the “Show friendly HTTP error messages” option is disabled by going to Tools, Internet Options, Advanced. According to the Room 404 website, the error message is named after the room number where the original database for the Web was hosted at CERN, the European research lab where Tim Berners-Lee developed the Web in the late 80’s.